Hi //celebrate play// readers and followers! Thanks so much to Erin for asking me to write a guest blog. 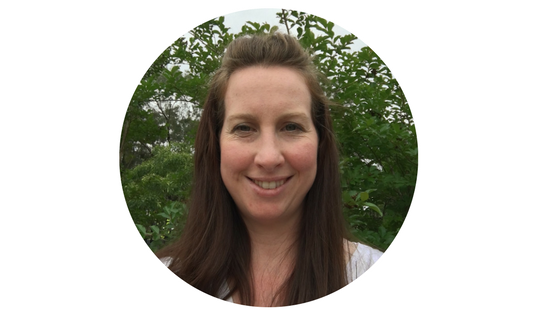 I’m Sarah, wife to Brendan and a mum to two girls aged 3 and 16 months old, and a high school teacher as well. Since first becoming a mum I’ve been interested in creating meaningful play situations and spaces, and I love being inspired by //celebrate play// content. 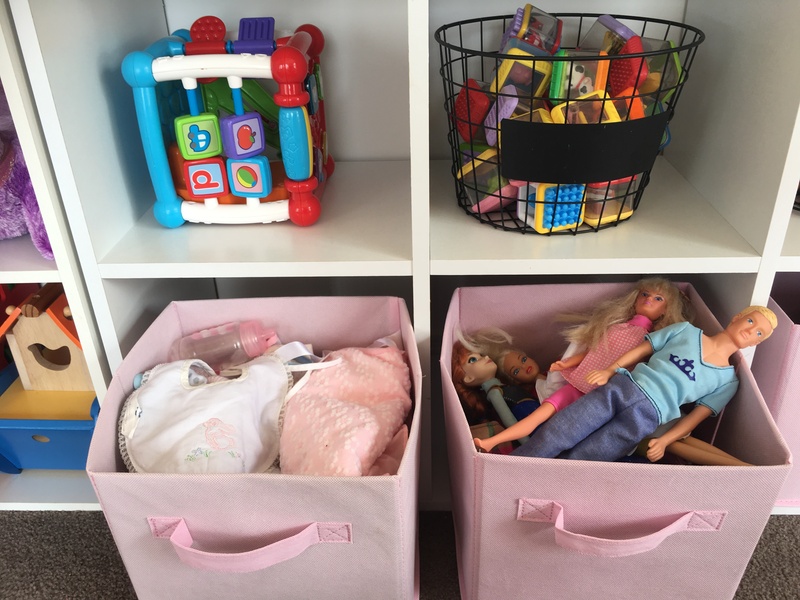 I started a blog back in 2015 to document my life as I navigate motherhood as well as my organising and decluttering journey. You can find me at Keeping Up With The Joneses on Facebook! 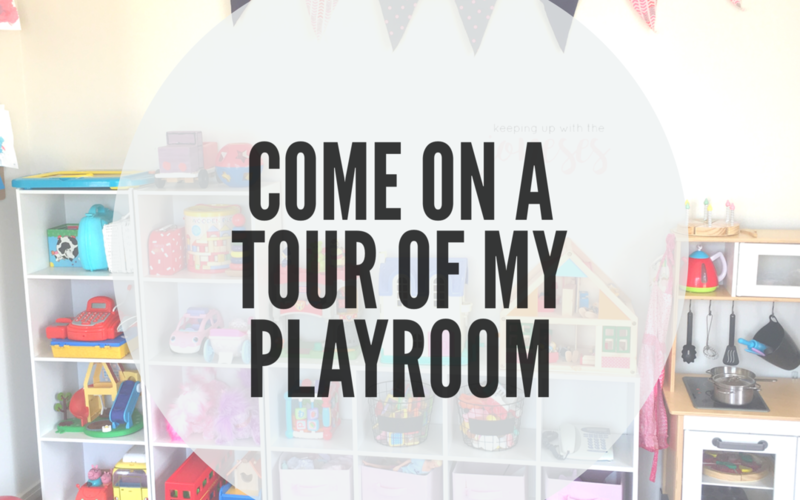 Today I’m going to take you on a tour of our playroom. We’ve only just moved into our new place and are excited to have a dedicated space for the girl’s toys. I didn’t just want it to be a place for toys though, I wanted it to be a place where creativity and imagination are free to flow! 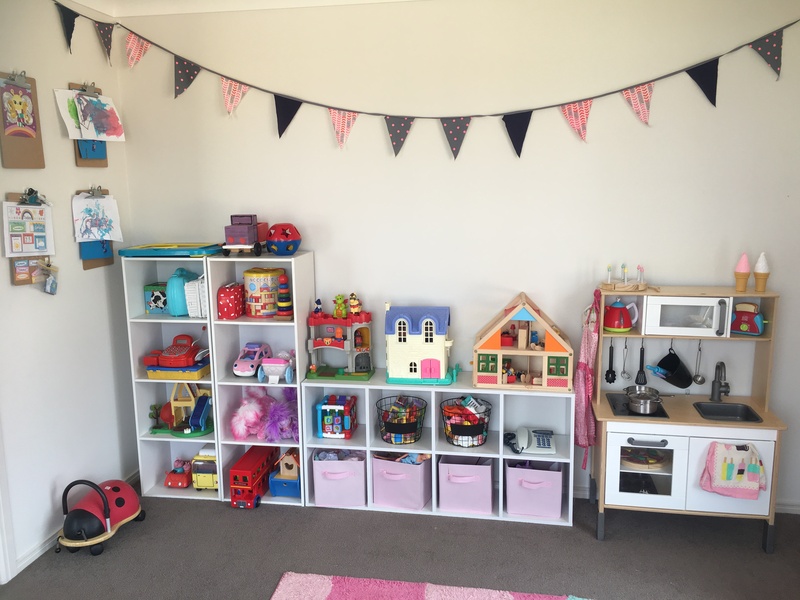 As I have a pre-schooler and a toddler, I’ve had to ensure the toyroom works well as a combined play space for these two ages. I love pretty things too, and have added in bunting and lanterns, as well as floor mats to make the room bright and cheery! 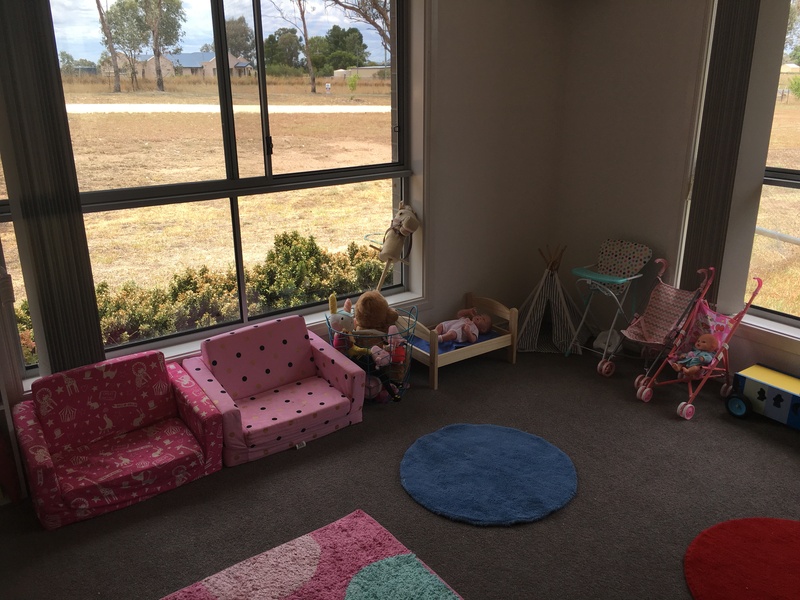 Our toyroom is just off our open plan dining / kitchen / living space, and when you first enter to the left are 3 cube-units for open storage of most of our toys. I’ve arranged them in this way so that the girls can reach and choose to play with everything they can see, but items with more pieces are higher up so that just Miss 3 is able to access these on her own. They include a doctor’s set, a picnic set, a tea-set and blocks. 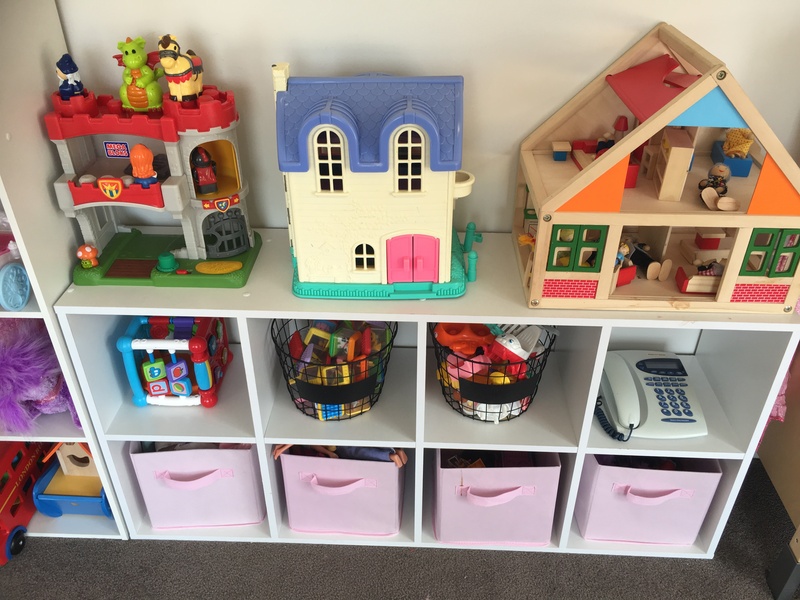 In these shelves we also have a cash register, Peppa Pig cars and a playground, Little People cars, Puppy Surprise dogs, and a wooden bus and wooden Noah’s Ark. On the lower shelves we have a mega blocks castle, Little People dollhouse and wooden people dollhouse. Underneath is a ‘turn-and-learn’ cube, blocks & Little People in the Kmart black baskets, and a play phone, and in the boxes below that from L-R are dolls accessories, barbies, cars and Mr. Potato Heads & ponies. Most of these toys we have been given, or I have found at charity shops. 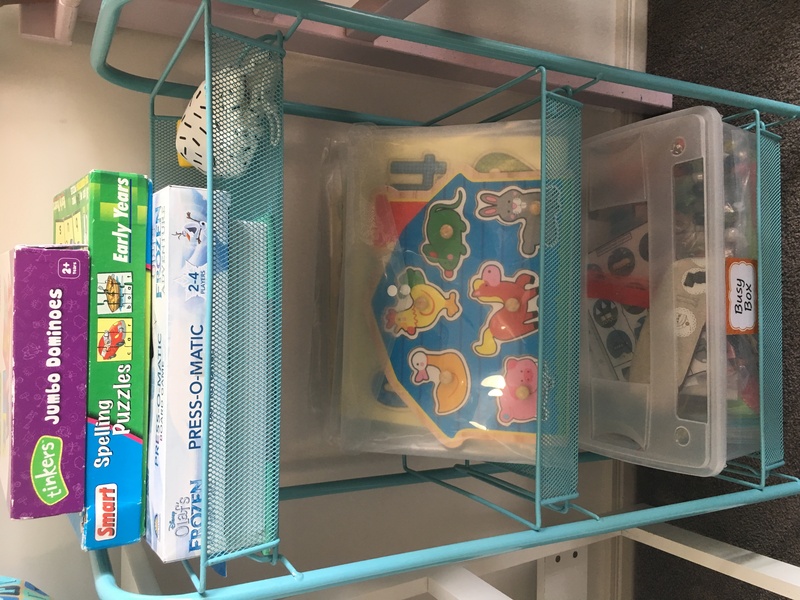 I need to have a good range for both a 3-year old, and a 16-month old, and I often watch what they are playing with most, and will declutter/donate or rotate on the shelves what they aren’t playing with very often or at all. I like that the cubes only hold a certain amount so that we don’t overload them – this is especially true of the fabric baskets. I like that lots of these toys are open-ended, and provide opportunities for the girls to use their imaginations when they play. 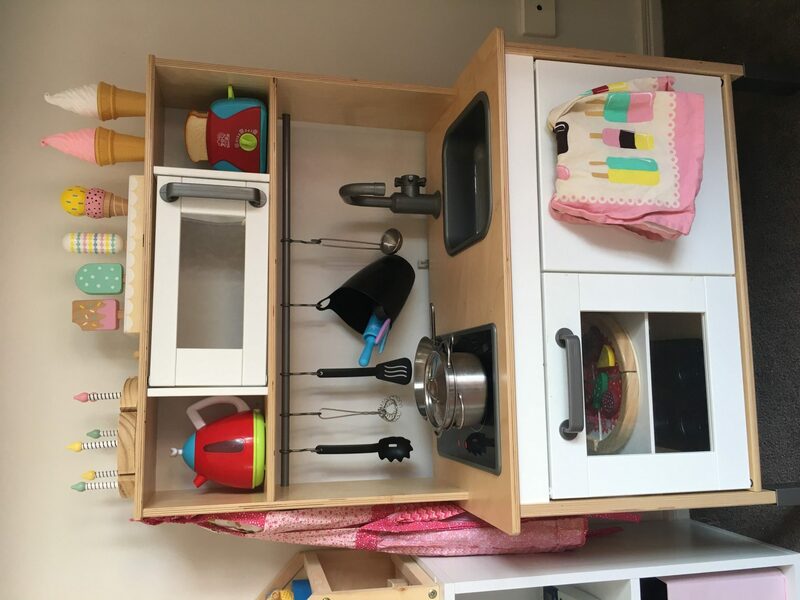 One of the girl’s favourite items in the toyroom is our IKEA kitchen. This is used multiple times every day by both girls. I love that the girls love to role-play, and be ‘just like mum’ in the kitchen! Most of the items in our kitchen were from Kmart – the cake and ice-creams are definite favourites. 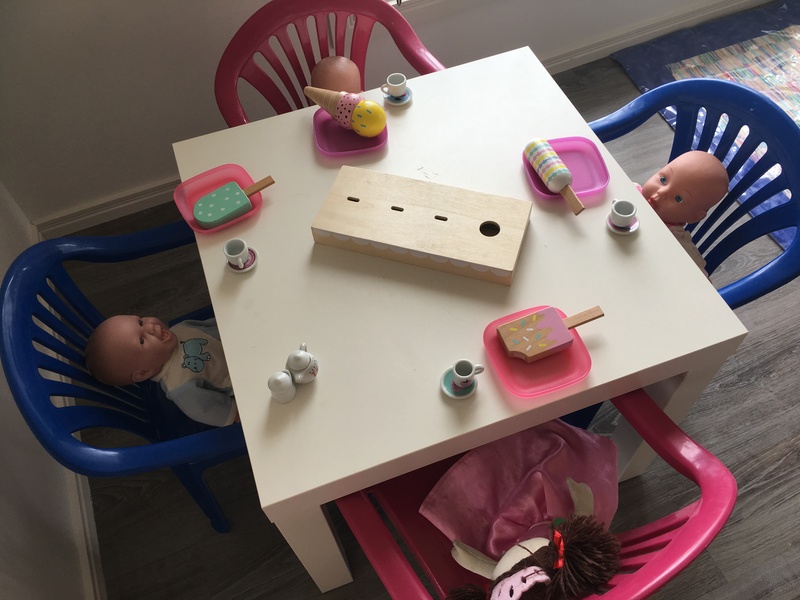 We have a little table and chairs set-up just outside the toyroom where I often provide an invitation to play – yesterday Miss 3 had set-up an ice-cream party for her dolls! 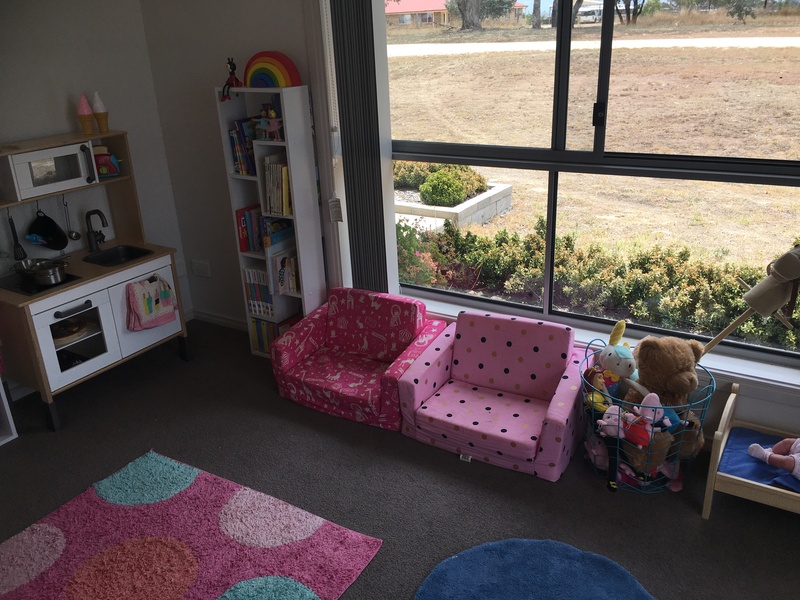 Next to the kitchen is a little bookshelf which holds small books (we have another bookcase in Miss 16-month’s room with larger books), and we’ve created a little reading area by placing the girl’s fold-out lounges (both from Kmart) here. The girl’s both love books and we’ve spent a lot of time reading in here! The board books and baby/toddler books are kept on the bottom shelves in easy reach of Miss 16-months. Then we have a basket of soft toys, and then another favourite space – our dolls area. 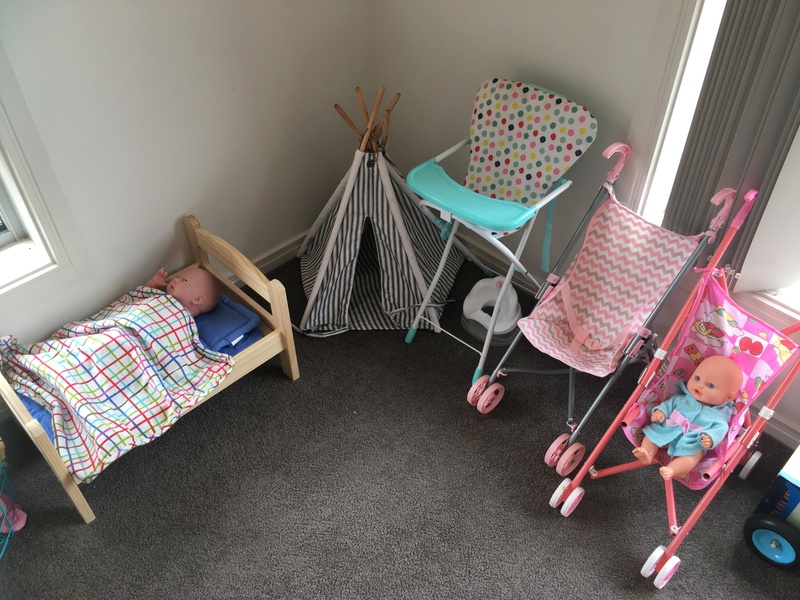 We have an IKEA dolls bed, Mocka tepee, highchair, potty, and 2 small prams. 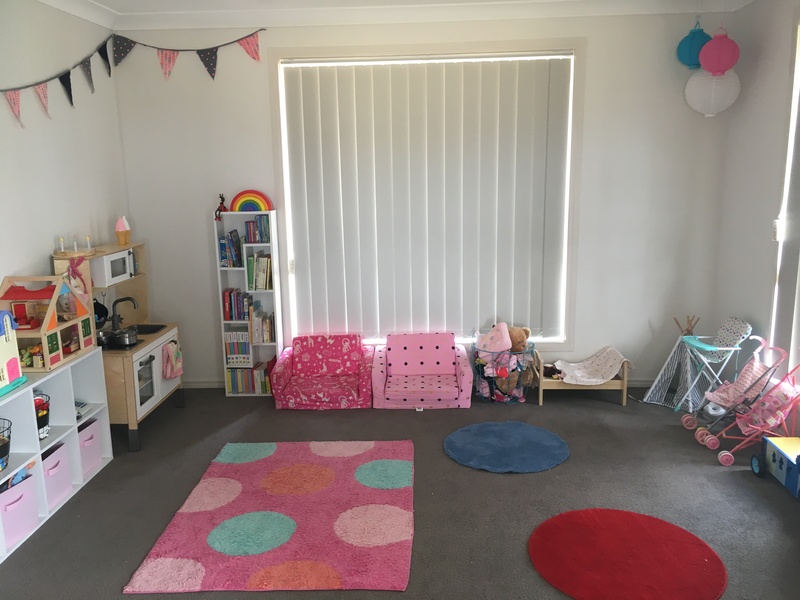 This space allows the girls lots of role-playing opportunities, as well as the ability to learn – it helped Miss 3 to learn toilet-training through role-playing her doll using the doll’s potty, and we are teaching Miss 16-months her night-time routines using the doll’s bed. Our dress-up area was created from a repurposed-towel rack, and a coat and hat tree from Kmart. 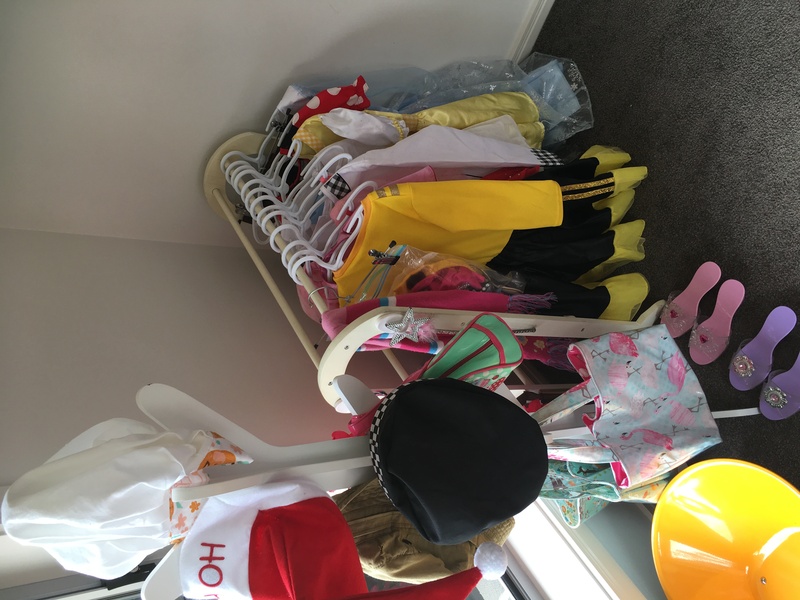 We found lots of dress-up’s at charity shops and Miss 3 uses this area multiple times daily. She loves to dress-up as a princess, or a mum, or a chef, Emma Wiggle, Elsa from Frozen, a doctor, and the list goes on. Another feature in our playroom that we love is our artwork wall. 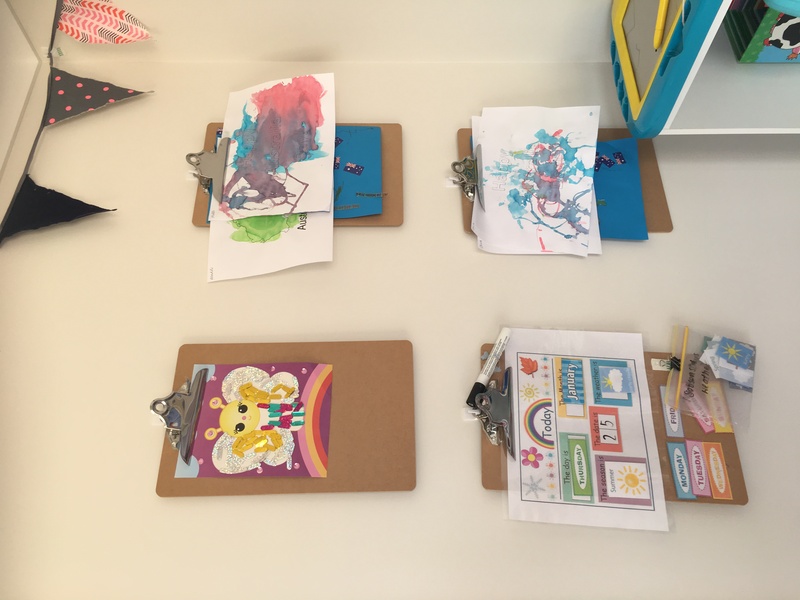 This is super simple to create – it is just 4 masonite clipboards from Kmart (only $2.50 each) attached to the wall using removable hooks. Miss 3 loves to see her masterpieces displayed. On the bottom left clipboard is our ‘today is’ laminated sheet where we can learn about the day, the date, the month, the season and the weather. 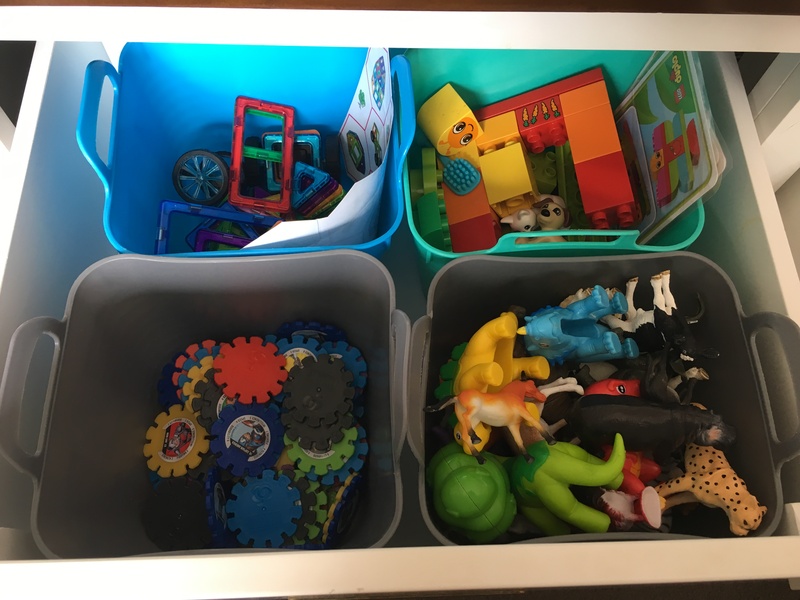 Just a quick look at some of the other toy organisation systems we have around the house – in our coffee table drawers in our loungeroom are 8 Kmart small plastic tubs, and I’ve organised some of the smaller toys here. We have, in the first pic from L-R: magnetic tiles, Duplo, marvel connector discs (free from Woolworths a few years ago) and animals & dinosaurs. In the second pic, from L-R: random small items (including a barrel of monkeys), then some more random items (including a melting snowman container, and some Wiggles figurines), a tub of balls, and then a kids Jenga game. All these tubs are perfect for open-ended imaginative games. In my office I have some kids board games & learning games on a Kmart aqua trolley, along with puzzles organised into clear document wallets, and then our busy box, which is a tub full of snap lock bags with homemade activities that can be generally completed quietly and independently, and help to develop creativity and fine motor skills in kids. This was created as part of a ‘busy bag swap’ where 13 friends and I each created 1 activity (x14 as this was how many were participating), placed them in snap lock bags, and met up and shared our creations. Instead of creating 14 different activities (which could have been very time-consuming, and costly, though it doesn’t need to be), we were able to share the load, and receive a variety of busy bags! Pinterest has lots of fantastic ideas if you want to create your own. 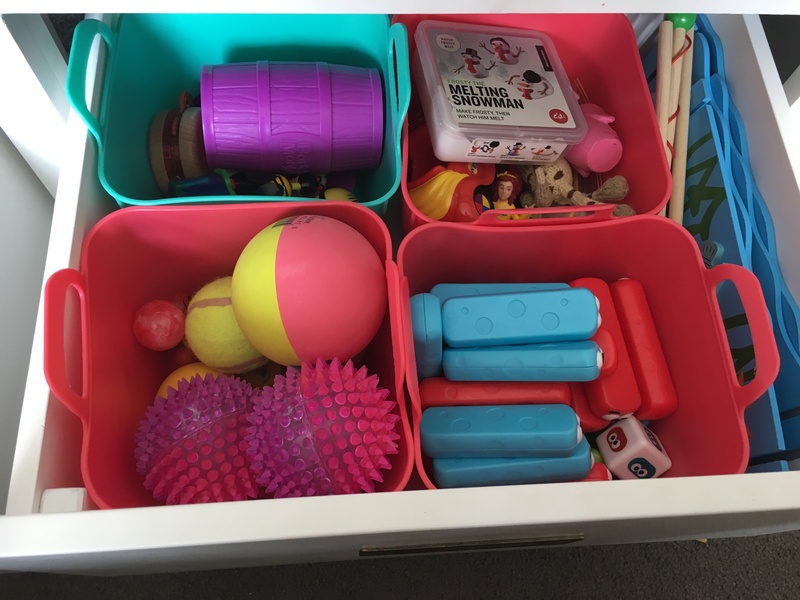 The $4 tubs from The Reject Shop that I’ve used in the middle are a perfect size to organise and store toys, and these particular toys are in this cupboard as they contain many small pieces, and I like to pull these out when we have extra time to set them up. 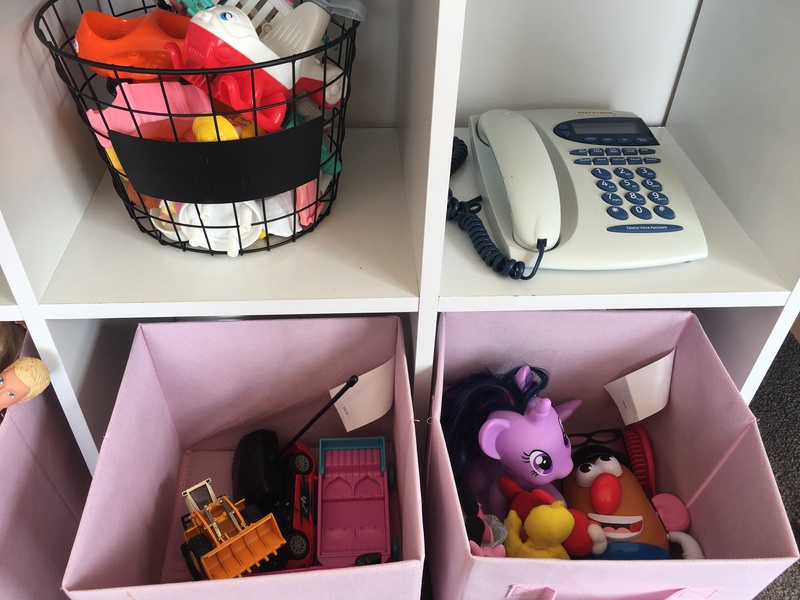 I hope you’ve enjoyed the tour of our toys and playroom, and perhaps taken some ideas away about how to organise and create a lovely space for your toddler and pre-schooler to use their imaginations, learn and make memories!